John William Strutt was born at Langford Grove in Essex, England, and was the first child of John James Strutt, the second Baron Rayleigh. In 1861 Strutt ventured to Cambridge University where he studied at Trinity College, the same institute attended by Isaac Newton. Strutt received his B.A. in 1865 and was elected a fellow of Trinity College. 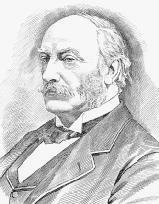 English physicist John William Strutt, the third Baron Rayleigh, who discovered argon. Since in those days there were no university laboratory facilities, Strutt established his own at the family home, Terling Place. There he started research in electrodynamics, color vision, radiation scattering, acoustics, and other experimental phenomena that could be explained in terms of wave motion. In 1870 he published his classic paper "On the Theory of Resonance" that established Strutt's reputation as a serious scientist capable of handling both experimental and mathematical problems. In 1871 he followed up with his well-known theory of light scattering by small particles (now called Rayleigh scattering) and explained how this phenomenon is responsible for the blue color of the sky. Upon the death of his father in 1873, Strutt inherited the family title and became the third Baron Rayleigh. With the exception of a short period (1879–1885) as the Cavendish Professor of Experimental Physics at the University of Cambridge, Lord Rayleigh spent the rest of his life working at Terling Place. He published a total of 446 publications covering many areas of physics. Strutt's best-known work, and one for which he was awarded the Nobel Prize in physics in 1904, was his unexpected discovery of the first rare inert gas argon. This element was discovered during his attempts to determine more reliable atomic weights by making very precise density measurements on gases. For nitrogen he found that when extracted from the atmosphere, it was heavier than nitrogen obtained by the decomposition of pure ammonia gas. He suspected that the nitrogen obtained from the air contained an impurity, and when Strutt published his density results, he requested suggestions on how to identify the impurity and correct it. William Ramsay, a professor of chemistry at University College, Bristol, took up the challenge, and, knowing that nitrogen could be removed from air by passing it over heated magnesium, he was able to isolate a pure sample of the material that was the cause of Rayleigh's difficulties. Also he showed, by its emission spectra, that it was a new species. Since the gas was found to be chemically inert, it was given the name argon, from the Greek word argos , meaning "inert." Ramsay and Rayleigh published a joint paper on the discovery of this new element in 1895, pointing out that its atomic weight of 40 and its properties did not fit into the Periodic Table current at that time. Ramsay went on to discover other inert gases now known as helium, neon, krypton, xenon, and radon and was honored for this work with the Nobel Prize in chemistry at the same time that Lord Rayleigh received the same award in physics. SEE ALSO Argon ; Ramsay, William . Lindsay, Robert R. (1970). Lord Rayleigh—The Man and His Work. New York: Pergamon Press. Giunta, Carmen J. (1996). "The Discovery of Argon: A Case Study in Scientific Method." Available from http://webserver.lemoyne.edu/faculty/giunta/ .